“Me, my mom my brother… we moved so many different places growing up, and it felt like a box. It felt like there was no getting out. It’s not just Durant’s life before which felt like a box for him. Whether he likes to admit it or not, his entire career as an NBA player has felt like he’s been stuck in a box, just getting dragged around with him unable to escape. When he first entered the NBA, he was seen by some as someone who good, but not exceptional. He had incredible skill in putting the ball in the hoop, but his slim physique (remember how he couldn’t bench press 185 pounds?) made it hard for some “experts” to see Durant dominating the league. Kevin was drafted 2nd by the Seattle Supersonics in the 2007 NBA Draft behind Greg Oden, where he was immediately seen as the franchise player for the Sonics. His very first season as an NBA player was decent. His scoring was certainly on full display, averaging 20.3 points. It was a good start for the young Durant, who was still clearly trying to look for his identity as a player in the NBA. In order to find that, one needs stability. Sadly, that was something which he wouldn’t get. In just his second season as an NBA player, the Supersonics franchise decided to move itself to Oklahoma City after failing to find public funding for a new arena in Seattle. Just like a box in a truck, Durant had no control over this decision by the owners of the franchise. He was forced to just tag along and just try to enjoy the ride. Enjoy the ride in Oklahoma City he did. Durant began his stint as a member of the Thunder with a bang, averaging 25.3 points per game. As an individual, he was starting to rise up the ranks. The Thunder were still stuck as a losing team, but considering their new acquisitions In Russell Westbrook and Serge Ibaka during the 2008 draft and James Harden in the 2009 draft, things were shining bright in Oklahoma City. Come 2009, Durant and the Thunder finally made their first big stride. From being a 23 win team the Thunder turned themselves into a force, giving eventual champions Los Angeles Lakers all they could handle in the first round of the playoffs. As an individual, Durant established himself as an MVP candidate, leading the league in scoring by averaging an absurd 30.3 points. The ride was getting better for him. A year after, Durant was finally able to showcase his talents in the Western Conference Finals, even creating a highlight moment after dunking over Brendan Haywood against the eventual champions nonetheless. Finally come 2012, Durant and the young Thunder made it to the Finals against LeBron James and his super team (Yes LeBron, it was a super team) Miami Heat, with some even envisioning the Thunder to go all the way. Sadly, James and company proved to be too much for Durant and the young Thunder. But that’s not to say that Durant had a bad first Finals series. He still put up 30.6 points per game on a ridiculous 54% shooting clip against the best player in the world. If the trend was to be followed, this Oklahoma City team would be a dynasty starting the next season with Durant as its leader. The reality of being in a box that’s just stored inside a delivery truck is that you have no control over where you’re headed to. 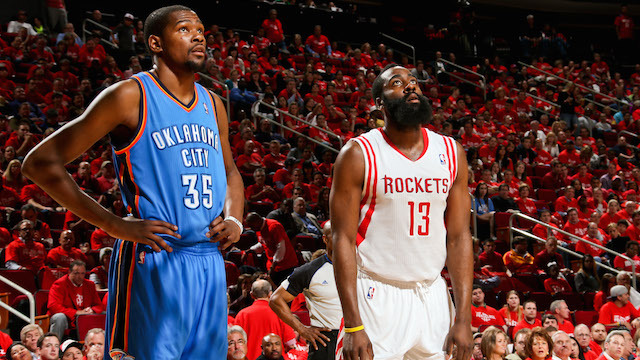 KD felt that the summer after he lost in the Finals when James Harden was traded to the Houston Rockets for Kevin Martin and a bunch of other pieces (one of which turned out to be Steven Adams so… yay?). It was only going to get worse from there. In the season after losing James, KD managed to lead OKC to a 59-23 record en route to the 1st seed. But come the first round, Patrick Beverley collided with Russell Westbrook, who suffered an injury because of the incident. Durant was on his own, and the Grit ‘N Grind Grizzlies proved to be too much to handle for him. After making it to the Finals the season previous, Durant couldn’t even make it past the second round. After that run, there was a noticeable shift when it came to Durant’s attitude. Before, he was known by many as one of the nicest guys in the NBA. “KD is not nice” was used for the sake of satire. But come the 2013-2014 season, “KD is not nice” turned into something that was real. Durant would cuss at the media when he would be asked things that he found to be distasteful. He’d do “Kill ‘em then pray for ‘em” taunts after huge dunks. He wasn’t afraid to say that he was sick of being second. In the process of doing all of that, he’d hit multiple game winners, score 50 points with ease. He carried an Oklahoma City team that faced a number of injuries. The result was a MVP award, the first of its kind for the young Oklahoma City franchise. That was supposed to be the moment that Kevin Durant broke free from his box. But life doesn’t work out that way. Another injury faced Durant and the Thunder come the playoffs, this time to Serge Ibaka against the San Antonio Spurs. Air Congo making a brief return to the Thunder despite being injured wasn’t enough as KD and the Thunder were eliminated in the Western Conference Finals. Durant left OKC that night with a ton of questions that were supposed to be answered come next season. The 2014-2015 proved to be the lowest point of Duran’s career. That’s where it really showed that he was still inside a box, with no control over what was occurring in his career. He was seen by many as the MVP favorite, but before the season could even start, Durant sustained an injury that would keep him out for six to eight weeks. He’d return, managing to even put up 30 points in the first half versus a Golden State Warriors team that was surging. But in that very same game, Durant was injured once again. It was a nightmare season for Durant. The Thunder failed to even make it to the playoffs that year. It was clear. Change was needed. It started with Sam Presti and company opting to fire Scott Brooks in order for them to bring in Billy Donovan. It was a move seen as risky by many. Come the 2015-2016 season, the prediction of people was somehow coming into fruition. OKC had trouble meshing themselves into the system of Donovan. They finished with the third seed, but fans knew that getting eliminated by the San Antonio Spurs was only inevitable. As we now know, that wasn’t what happened. At all. A completely different Oklahoma City team came out in that series, as they ran over the Spurs en route to a collision course with the Golden State Warriors. At that time, Golden State just finished a historic 73-9 season. They were doing things which many saw that the Thunder were supposed to do. That didn’t matter now. 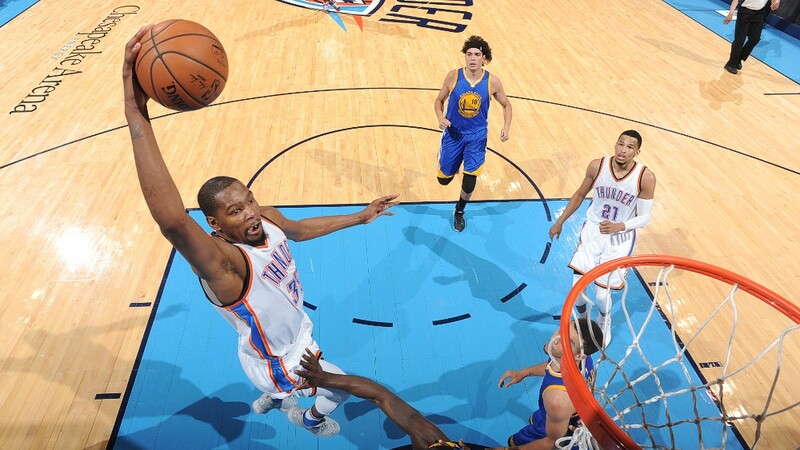 This was Durant’s chance to help reclaim OKC’s throne as the West’s best. But that’s the thing with having to realize change. Sometimes, you have to be hit again and again AND again in order for you to make that move that will make you a better individual. Durant was about to fall into the trap of believing that everything was fine in Oklahoma City. A couple of Klay Thompson long bombs later and a million isolation plays coupled with ridiculously stagnant offense and poor spacing, Durant was once again left in the dust. Game 6 turned out to be Durant’s last game in OKC as a member of the Thunder. Game 7 turned out to be his last game against the Golden State Warriors. He wanted to go out of his box. He needed a place that would allow his talents to flourish and show itself. There was only one place that had the culture, system and individuals that would allow him to do that. Kevin Durant was going to be a Golden State Warrior. Many saw this as Durant moving to another truck with Stephen Curry driving him towards a championship. For most of the season, it felt that way. We didn’t see the Kevin Durant that won MVP with the sheer dominance that he showed. He was efficient, but a large part of that was because of the ridiculous talent and space which surrounded him. What many failed to see was the continued growth which Durant experienced as a member of the Warriors. Random thought: KD to the Hawks would pretty much be end of the world stuff. All of that stuff is cool. The thing is, for fans, what truly matters is how you perform in the big stage. Many predicted Durant to just chill and allow Curry to drive him to the Finals. Kevin Durant was just another member of the band that was led by their sweet-shooting cherubic front man. Durant wasn’t having any of it. The Warriors didn’t just give him the stage to be a roadie for the band. He straight up grabbed the mic and wanted to show that he was going to be the front man of the team. He can deny all he wants and say that he’s just another member of the band. That’s not the case at all. Durant was the one who sang the big notes when the going went tough for the Warriors. It was Durant’s time, and he knew it. He showed it, against James, his biggest rival and tormentor ever since. The growth that I mentioned previously was on full display against Cleveland. In Game 1, we saw how much of an impact Durant makes on the offensive end because of the sheer amount of attention he requires at any period of time. Come the next game, we were witness to the evolution of Kevin Durant as the complete player, putting up a stat line that is unheard of in the Finals. In Game 3, we got a masterpiece from him. It wasn’t a statistical masterpiece by any means. When you look at what he did based on stats alone, you would dismiss it as normal. Just a typical Kevin Durant performance. In the fourth quarter, when the going was getting tough for the Warriors, that’s when Durant just grabbed the mic when they needed him to hit the big notes. He sang his masterpiece, and boy did he deliver. He performed it right on the face of his biggest rival ever since. Oracle Arena was starting to go bananas as early as the four minute mark. Curry, Green and Klay Thompson remained composed. Durant tried to do the same. But with one minute remaining, his emotions got the better of him. At one point, he just stood there, put his hands on his knees and smiled. Andre Iguodala told him that it isn’t over yet, but was it really? It was over no matter what. Tracy McGrady wasn’t on the other team. Kevin Durant was going to be a champion. With his first ring, Durant just moved into his first apartment. But this first apartment isn’t just something that is hollow and without any meaning. This was his moment where he finally got out of his box, after being moved around and having no control time and time again. Finally, Durant has some semblance of control. He finally made it. In the process of getting his very first apartment, Durant actually managed to get some hardware. It was a rarity, something only those who are truly worthy can get. Finals MVP. It’s not just something to make this first apartment look nicer. It’s something which shows that Durant didn’t ride his way to the Finals. He straight up grabbed the steering wheel and brought the Warriors to the Promised Land. You can call him all of the names. Traitor. Coward. Soft. Snake. Cupcake. Those don’t matter to him now. Back then, when he was still stuck in a box, those things mattered to him. Now, he’s free, with complete control of everything. That championship burden is no longer on him. Make no mistake about it though. This isn’t the end. Many see getting their first apartment as the end of it all. This is fine already. All good. But he didn’t get to this point by saying it’s all good. Things are just starting for Kevin Durant. It’s only going to get better for him from here on out.